In this blog post I'm going to explain how to get-rid of the scientific representation ( ex: 2.2908408306E44 ) and get the non-scientific representation of the number when large numbers are mediated through the XSLT mediator. Following diagram explains the problem that I'm going to explain. Note that the large number that is sent across the mediator is derived from defined xpath and do some mediation logic to that particular number. (in this example multiplied by 55 ) The non-scientific number that we sent across the mediator has been converted in to a scientific number. When is this problematic ? Assume that the number that is sent across the mediator is a customer ID. And the mediated customer ID will be sent through some other mediation logic or will be sent to a login portal. But that end will be expecting a non-scientific representation of the customer ID and this will result in a failure in that end. Why is the large number represented in a scientific format ? If you have used WSO2 ESB versions earlier to ESB 4.5.0, you might have noticed that this conversion does not happen. Reason behind this representation is from ESB 4.5.0 on-wards the XSLT engine that does the XSLT mediation has been replaced from xalan 2.7.0 to saxon. So saxon converts large numbers in to scientific representation. How to reproduce the above scenario ? I will explain how you can reproduce the above scenario using a sample proxy configuration with a sample XSLT style-sheet. 1. Start WSO2 ESB (tested in ESB 4.7.0) and create a proxy service using the following synapse configuration. 2. Go to Browse under Registry in the left pane and navigate to /_system/config/users/ and Click on Add Resource to add the given XSLT style-sheet (Add it as transform.xslt) and Save. 4. Use the following sample request to test out the behavior. And then click on Send. 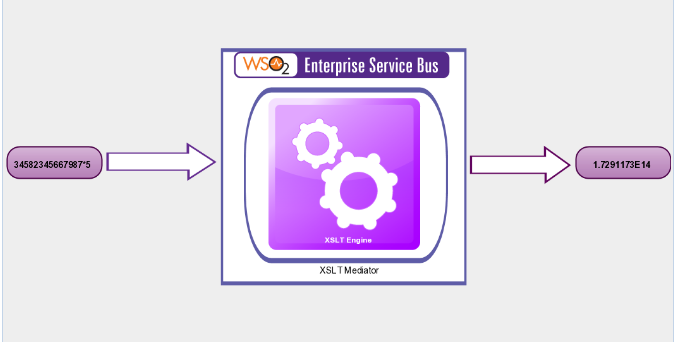 In the sample proxy configuration I have set to log the message before it is sent through the mediator and the message after it is mediated by XSLT mediator. Following are the logs that got printed in my console. Note I have marked the important parts of the log in red. Observe that id which was originally in non-scientific format is converted in to the scientific format once it is sent through the XSLT mediator. How to get-rid of the scientific representation ? Now let's look at how we can avoid our number getting converted to a scientific representation. There are two approaches that we can take in order to get this done. Change your XSLT style-sheet to get the number formatted back to non-scientific representation as in the following manner. You can edit your style-sheet as follows. Go to Browse under Registry and navigate to /_system/config/users/transform.xslt and click on Edit as text and modify your XSLT style-sheet. So at the end of the day your complete style-sheet will look as below. Replace the XSLT engine saxon with xalan. Although this is not a recommended approach, you can get back the non-scientific representation by replacing the XSLT engine in WSO2 ESB with xalan. For that download a WSO2 ESB version prior to 4.5.0. Then follow the below steps. 1. Go to ESB_HOME_4.7.0/lib/endorsed/ and back up saxon9he.jar and delete it. And then try the transformation proxy with the same sample request. So you logs will look like as follows once you have taken any of the above suggested approaches. Observe that the number is back in non-scientific format !! !